The Met Gala is my favorite annual fundraising events and the theme this year was China: Through the Looking Glass. There were a range of different costume choices from traditional to a more modern interpretation of the culture. Everyone has their own opinion about who was best dressed, but what about the other categories? 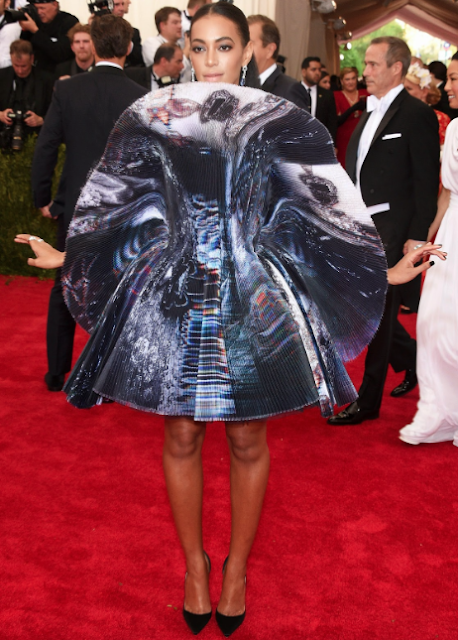 Solange never ceases to amaze us with her eclectic taste in fashion, this costume being a prime example. It may have been jarring for some of the public who have grown used to her monochromatic outfits an afro that can make any natural hair guru jealous. Solange really took a step out of her norm with this ensemble but executed it perfectly! Sarah Jessica Parker donned the red carpet wearing a collab created by H&M and their Conscious collection. The costume implemented environmentally conscious materials while still staying true the events cultural theme. Kim looks stunning in Roberto Cavalli while getting slammed by the Beyhive for "stealing" ideas from Beyonce as inspiration for her gown choice for this years Met Gala. According to her instagram, Cher was the true influence behind her gown choice and she gushed on social media about meeting her idol in person during the event. Even though Beyonce reportedly showed us in a fashionably late fashion, the singer still managed to stop the world in her peek-a-boo gown that covered all her personal assets in jewels. With one of the most supporting fan bases, it took little to no time for Beyonce's gown to make its debut on a series of different social media timelines. Beyonce definitely worked the red carpet serving face in Givenchy Haute Couture. Fan BingBing was my choice for Best Dressed because she was an unfamiliar face for me who made a striking first impression. As if the gold sequins gown was not enough to make the Chinese actress stand out on the red carpet, her intricately patterned cover up demanded all the attention. The only thing that may age better than these two, has to be wine! As timeless as any good fashion piece Cher and Naomi looked better than ever in their costume choices for the night. As veterans to the fashion game, they never cease to disappoint in giving the younger generation something to look forward to. What a train! Chinese designer Guo Pei deserves the credit for Rihanna's stunning couture costume. It took the designer two years to make; and at a striking imperial yellow the gown pays tribute to China's tradition and past while embodying a new expression of the Chinese heritage. Kendall Jenner looked amazing in her Calvin Klein dress which fit the new face of the brand perfectly. The younger sister of the Kardashians is constantly making strides to make a name for herself even amidst all the media buzz surrounding both sides of her family. The details of the gown posted on Instagram shouldn't be ignored because there is definitely more than meets the eye!